Are lower-risk portfolios with higher returns really too good to be true? More risk equals more return. Less risk equals less return. These are the commandments of the capital asset pricing model (CAPM), taught to first-year business students all around the country. Sounds reasonable enough, but the CAPM is not one of Newton’s laws of motion; it is just a theory. In reality, while markets are highly efficient, they are not perfectly efficient, and there are certain market anomalies that violate the laws of the CAPM. One of these anomalies, known as the “low-volatility effect,” argues that portfolios of low-volatility stocks tend to produce higher risk-adjusted returns than portfolios of high-volatility stocks. Lower risk with higher returns sounds too good to be true, but the evidence at this point is overwhelming. Haugen and Heins first introduced the concept of the low-volatility effect in 1972, studying stocks over the period from 1926 to 1972. Since then, there have been numerous confirming studies, including Haugen and Baker (1991); Clarke, de Silva, and Thorley (2006); Blitz and van Vliet (2007); and Baker, Nardin, and Haugen (2012). While the evidence supporting the low-volatility effect is indisputable, it is important to remember that this does not mean the outperformance is anywhere near a constant. Far from it. All anomalies have cycles and undergo periods, sometimes long periods, in which they underperform. In the past year, I’ve emphasized this point in writing about the value and momentum anomalies. Now I want to focus on the volatility cycle by analyzing the S&P 500 Low Volatility (Low Vol) and S&P 500 High Beta indexes. These indexes pull the 100 lowest volatility and 100 highest beta stocks from the overall S&P 500. The look-back period is the preceding 252 trading days, and the indexes are rebalanced quarterly. The inception of both indexes dates back to November 1990. How have the indexes fared since inception? The Low Vol Index has produced an annualized return of 11.0%, with annualized volatility of 11.0%, trouncing (on both an absolute basis and a risk-adjusted basis) the High Beta Index that returned 8.9% with volatility of 28.2%. End of story? Not exactly. You see, following the Baker/Haugen (1991) study, which analyzed stocks up to 1990, High Beta would go on to outperform Low Vol in eight out of the next nine years. The cumulative return from the High Beta Index over this period (1991–1999) was 696% (26% annualized) versus 279% (16% annualized) for the Low Vol Index. How many investors, particularly toward the end of this period, would have stuck with low-volatility stocks and avoided the temptation to chase high beta? Not many. What happened next? The Tech bubble burst and Low Vol outperformed High Beta in each of the next three years (2000–2002), producing a cumulative gain of 21% during this period versus a 65% decline in High Beta. From there, a new bull market ensued. 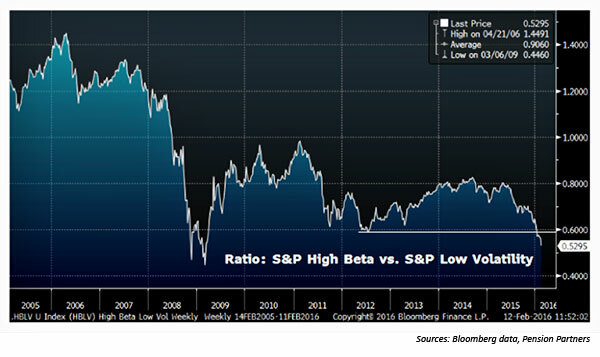 High Beta outperformed Low Vol by 57% from 2003 to 2005. From there, Low Vol would again outperform in each of the next three years (2006–2008), which, of course, included the financial crisis of 2008. A new bull market was born in 2009. 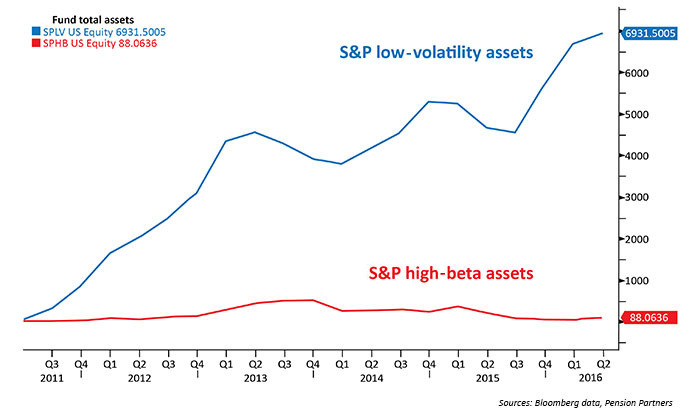 High Beta outperformed Low Vol by 63% from 2009 to 2013 (a 174% gain versus a 111% gain). Since then, Low Vol has outperformed with a 29% gain in 2014–2016 YTD versus a 1% loss for High Beta. What does all of this back and forth tell us? That volatility is cyclical. 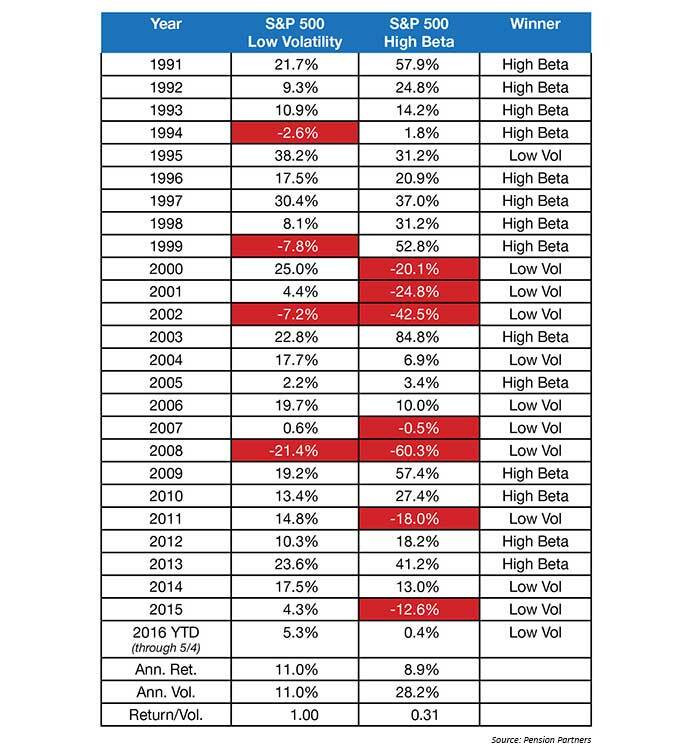 While Low Vol may outperform overall, it does not come anywhere close to always outperforming. 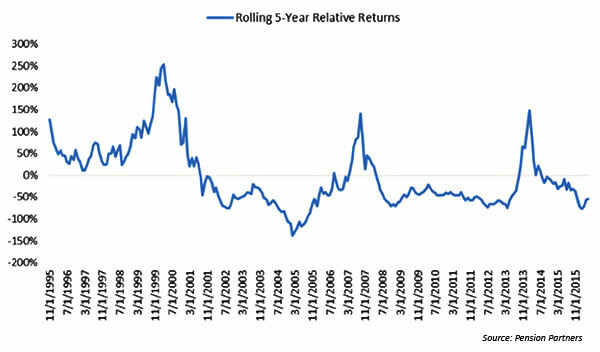 If we look at rolling five-year returns, Low Vol has topped High Beta 62% of the time. That means that since 1991, five-year returns were higher in High Beta than Low Vol 38% of the time, and at times significantly higher. Where are we in the volatility cycle today? Well, the most recent five-year period shows a return of 83.8% for Low Vol versus only 28.5% for High Beta. If we pull this back to the past 10 years, we find that Low Vol has returned 145.3% versus only 13.3% for High Beta. This is an unbelievable spread over a 10-year period. Back at the February 2016 stock-market lows, I noted that the ratio of High Beta to Low Vol had moved all the way back to March 2009 levels. This was an incredible development considering the S&P 500 had more than tripled during this period. Another way to see the extreme outperformance of Low Vol at the February lows was to look at the performance of the ETFs designed to track the High Beta (SPHB) and Low Vol (SPLV) indexes. I tweeted at the time that SPLV had advanced 69% since its inception in 2011 versus a decline of 0.2% for the SPHB. Given this backdrop, I think it’s safe to say the environment has been favoring Low Vol for some time now, perhaps an indication that the near-term cycle may begin to favor High Beta. Other evidence of a possible change in leadership? Fund flows. Josh Brown of Ritholtz Wealth wrote an interesting piece recently on sentiment, noting that the U.S. minimum volatility ETF (USMV) has had the largest inflows of any ETF year-to-date, topping even the Gold ETF (GLD). Also on the list of largest inflows is the EAFE Minimum Volatility ETF (EFAV). If we look at SPLV and SPHB since their launch in 2011, we find an incredible spread in terms of assets. The Low Vol ETF (SPLV) has raised $6.9 billion versus only $88 million for the High Beta ETF (SPHB). These flows are likely (1) a product of increased awareness of the Low Vol anomaly combined with (2) the incredible outperformance of Low Vol over the past few years and (3) fears of another 2008. We may be reaching a point, though, where past outperformance comes at a price. The price here being lower future returns due to elevated valuations. If we look at the Low Vol ETF, it appears more expensive on virtually every valuation metric than its High Beta counterpart. None of this is to say that Low Vol will crash from here or has to underperform High Beta in the coming months. Extreme can get more extreme, and cycles can last longer than you think. At the very least, though, a modicum of caution is warranted, especially if you are just learning about the Low Vol anomaly and are tempted to chase this area higher after the fact. Given the history of the volatility cycle and where we are today, such a strategy is nearly guaranteed to fail. As I have written about value and momentum, chasing past performance in an anomaly can be harmful to the point of eliminating any benefit of adding that factor to your portfolio. The best time to diversify into an anomaly or asset class is after a long period of underperformance, not outperformance. This is easier said than done, of course, and why most investors will not reap any benefit from anomalies even if they do persist. What does this mean for the overall market? I find it very interesting and unusual that the S&P 500 Total Return Index hit a new all-time high just a few weeks ago, with low-volatility stocks leading the way higher. Many would call that a bearish signal—which may end up being right unless conditions begin to change soon. If there is to be a cyclical rebound this year and a sustainable leg higher in the equity market, one would hope to see High Beta stocks lead that move. While we’ve seen some improvement in High Beta since February, we need to see more—that is a critical part of the “Silver Linings Playbook” for the 2016 market I wrote about earlier this year.